I am not the present wrapper in our home. I use too much tape, don't properly crease or tuck corners, and generally end up satisfied as long as the gift is completely covered in paper. My boyfriend, on the other hand, is a present-wrapping perfectionist. He uses neat tape squares, different folding methods, and will redo a present until it's perfect. I'm glad he hasn't caught on to aligning paper patterns, because then Christmas would never come. But this year I have a secret wrapping weapon: gingerbread gift tag cookies. With a little royal icing, some patience, and some piping gel, my presents might come out on top this year. 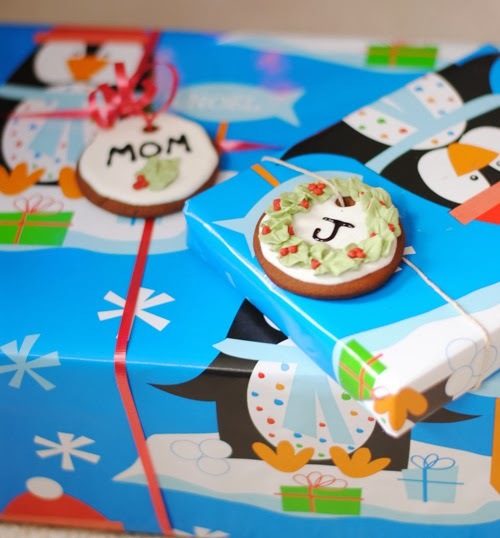 Just tie them onto your present ribbon and you have festive edible 2-in-1 gift tags! They also look adorable as edible tree decorations. Preheat oven to 375F and line two baking sheets with parchment paper. Remove the dough from the fridge and allow to warm up slightly. Roll it out on a lightly floured surface to about 1/2cm thick. Cut the dough using a small biscuit cutter (or cup, or other cookie cutter shape). Place them on the lined baking sheet, and repeat using the dough scraps. Cut out a hole on the top using a straw; this is where the ribbon will go. Bake for 8-10 minutes, two trays at a time. Repeat until all the dough is used. (Or save some for later!). Allow to cool on a wire rack. Combine meringue powder and water in the bowl of a stand mixer. Beat with the whisk attachment until frothy. Add the icing sugar and beat until peaks form. To decorate the cookies, set aside 1 cup of the icing in a closed container. With the remaining icing, add water one teaspoon at a time until the icing is smooth and glossy, but still holds its shape. 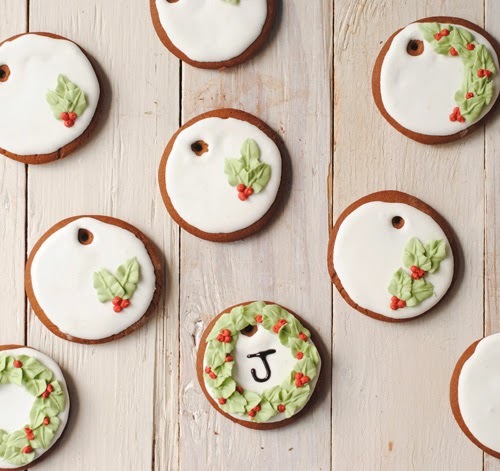 Scoop into a piping bag with a circle tip (I used Wilton #3), and outline one cookie at a time, flooding to fill in. Set aside and let each cookie dry. When it's time to decorate, dye half the remaining icing green and half red. Use a leaf tip to gently pipe on the holly leaves (you could also use the circle tip again, and draw them freehand). Dot each holly patch with red berries. Write a special message on each tag with the black piping gel, and you're set!